Gian Carlo Mingati has created a jQuery News Ticker called liScroll which is very easy to use. It transforms any given unordered list into a scrolling News Ticker automatically as well. If you want your list to scroll faster or slower than the default value, modify the travelocity param. The scrolling automatically pauses when you mouse over it. If you would like to pull your news items from a xml file, You should check out his xml-based newsticker with fade in and out effect and xml-based newsticker scrolling effect as well. Matt Berseth has created a CNN Style Scrolling Ticker with the Marquee Toolkit Control. 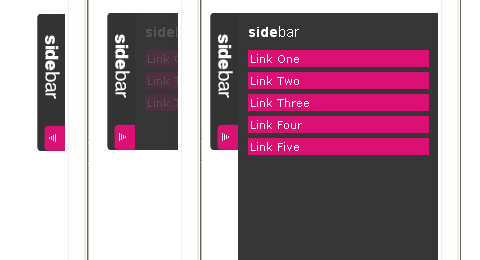 It supports both left-to-right and right-to-left scrolling directions. You can easily apply a CSS class to the item when it is moused over. And also it support dynamically repopulating the marquee after it has finished scrolling. Nick La from WebDesignerWall shows us how to slice up the menu design (step by step) and put them together with CSS. Most of you probably know how to code a horizontal or vertical CSS list menu. Now let’s take it to the next level — code an advanced list menu utilizing the CSS position property. You can view the working example here. There are plenty of DHTML tabs scripts out there but most of them are either poorly coded, library/framework dependend or bloated with unnecessary functionality. So Grzegorz Wójcik has decided to come up with this simple, yet functional tab interface implementation. It is called Yetii, stands for Yet (E)Another Tab Interface Implementation. It has the following features. We love Mac, we love Fish Eye Menu. The idea behind a fisheye control is a strip of icons, being vertical or horizontally laid out that reacts to the user’s mouse as it approaches the icon. Here is a list of Nice Fish Eye Menu for you to dowload and use it in your web application. Phatfusion has showed us another way to build our menu, he has created a image menu with the aid of Mootools framework. It looks really good and easy to use. It is very similar to the menu design of Mootools Official Website. It has the following features. It allows onClick event keeps selected item open. Click open item to close. Specify a function for the onClick event. Auto open when the page loads. FastFind Menu Script is still under development and has been tested in FF1.5-2, IE 6-7, Opera 9, and Safari. The current build has the following issues in Safari: Arrows do not appear to show in-menu versus external links, as appear in the other browsers.